The rupee appreciation that was witnessed in the past few days will have a positive impact on the economy, an investment professional said. “The depreciation of the rupee brought a negative side to the country’s economy. A correction with regard to the over depreciation of rupee is taking place at present. The over depreciation of the rupee compared with the index has come to an end and this is a positive sign for the economy,” former President Stock Brokers Association of Sri Lanka, Ravi Abeysuriya said. Foreign investors are investing in government Treasury Bills and with a certain amount of inflows coming into the system by way of funding such as International Sovereign Bonds and the building up of reserves, have enabled the appreciation of the rupee. These will have a positive impact on the economy while the reversal of treasury instruments has reduced the amount of hot money coming into the system, he said. The rupee depreciated by 19 percent last year. The exchange rate for the Dollar as at December 31, 2018 was Rs. 184.69. It is the highest exchange rate for the dollar so far. The rate has dropped by Rs. 4.50 to become Rs 180.19 as at January 31 this year. The exchange rate as at March 22 was 179.79 and the rate for last Friday was 178.02. The rupee has appreciated within the past week bringing down the exchange rate further. Export earnings which also impact the exchange rate is been converted to rupees to keep down borrowing cost. The exchange rate is subjected to maturing of foreign borrowings, exchange required for exports and payment of oil bills which is rising. However, the government needs to prudently manage the borrowings, he said. “If we are able to move towards hundred rupees/dollar with regard to the basket of goods, not over valued or under valued, the industry confidence and investor interest will grow. As rupee depreciation is negative for any investor and the appreciation of rupee which is happening at present is a positive sign,” he said. The present investment in the stock market will go up with the building of investor confidence. The signs are all around positive. We are in the right direction. The rating agencies which downgraded the country’s ratings will evaluate it again. With better rains and better harvest, the country will have improved living standards and more economic benefits, he said. The decision taken by the Central Bank to monitor and restrict the ‘hot money’ coming in to the country is a good move. It’s limit was 10 percent and has come down to 3.5 percent at present. The uncertainty of foreign investors investing in Sri Lankan rupee debt instruments has been removed with this move. The 5 percent limit was too high and now it is at the correct level. This is an encouragement for investors, he said. “If the rupee appreciation trend continues it will be a good thing for the country’s economy. This is good news and not damaging the economy. We will not see money moving up in the future,” Abeysuriya said. 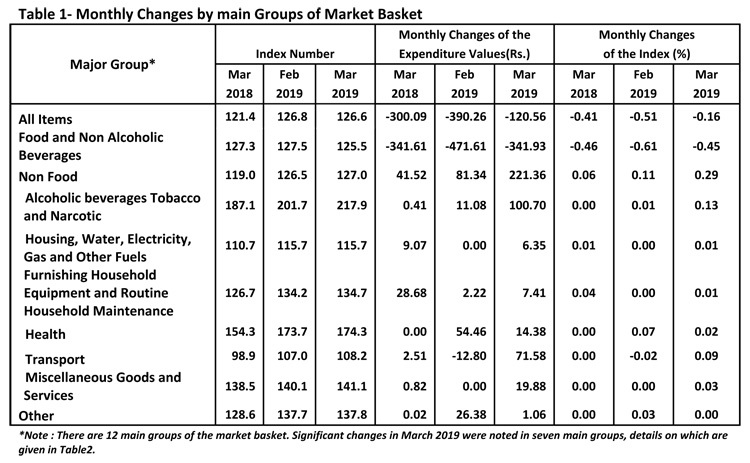 Sri Lanka’s Colombo Consumer Price Index (CCPI) accelerated to 4.3% year-on-year in March this year from 4% recorded in February, as inflation on non-food items increased, recent statistics outline. Accordingly Department of Census and Statistics latest data noted that the price deflation in food items during March 2019 remained unchanged at 1.4% year-on-year, while the inflation on non-food items accelerated to 6.7% from 6.4% a month ago. Meanwhile the data also highlighted that the 12-month moving average inflation in March remained unchanged at 4.1% for the third consecutive month, as the moving average inflation on non-food items increased to 5.3% from 5.1% a month earlier, though food inflation decelerated to 1.2% from 1.7%. Sri Lanka is among countries having high levels of commercial debt with rising interest burdens that are vulnerable to rollover risks, according to the International Monetary Fund. It was among countries that faced tighter financing conditions and rising risk premiums last year. “Many economies saw rising interest burdens, which exceeded 20 percent of total revenue in 2018 in Egypt, Pakistan, and Sri Lanka,” the IMF said in its latest Fiscal Monitor report. According to the IMF, Sri Lanka’s maturing debt in 2019 is 13.5 percent of gross domestic product, falling to 12 percent in 2020. The island’s total financing need is 18.1 percent of GDP this year, falling to 15.5 percent next year. The IMF said that removal of tax exemptions, in countries like Argentina, China, Sri Lanka, and Turkey, and improving administrative efficiency would yield more revenue for priority initiatives. At a subsequent news conference, Anna Ilyina, Division Chief, Monetary and Capital Markets Department of the IMF, said countries should tackle high debt burdens through a comprehensive set of measures. These include “a careful monitoring of debt vulnerabilities, improved [debt] data transparency, and increased debt management capacity,” she said in response to a question on the rollover risks faced by some of the developing nations, like Sri Lanka. “Looking across low‑income and developing countries, we can see that public debt levels have increased significantly in recent years in many of those countries,” Ilyina said. “In fact, the median level of debt is now close to 50 percent of GDP. And the number of countries that are now either at high risk of debt distress or are already in debt distress is high. It is over 40 percent. Ilyina said that the problem arose after many of the countries have increased their reliance on market financing with relatively favorable external borrowing conditions. Tobias Adrian, Financial Counselor and Director, Monetary and Capital Markets Department, said that in many frontier markets, the IMF sees that the share of debt that is not conforming to the Paris Club standards is on the rise. The Paris Club is a voluntary, informal group of creditor nations that provides debt relief to developing countries, either by agreeing to renegotiate or reduce official debt owed to them on a case-by-case basis. China, which has emerged as one of the biggest lenders to Sri Lanka, is not a member of the Paris Club.